It’s amusing to hear those names, which spell danger, and daring, and conquest. It is interesting, too, to note how desperately we need words to make the world our own, to label and thus appropriate things. 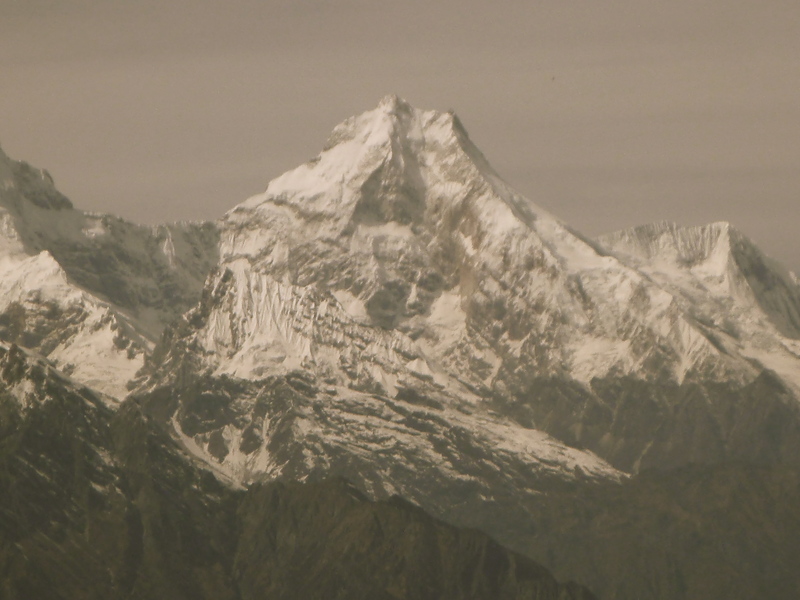 ‘You’re our mountain,’ we tell Yangra as we briefly examine and hastily name her features. But why the haste? Is it because once we take a closer look at someone or something, we find it harder to project ourselves onto what has more than enough substance of its own? Is it that it is almost impossible to give just one name, assign one word only, to something which has revealed itself to have so many different aspects, angles and layers? It seems that we must attach a tag to and claim ownership over things immediately or never, for if we linger, we will have to study what we simply wish to possess, and only then come up with a well-though-out description – not one given on a first impression. 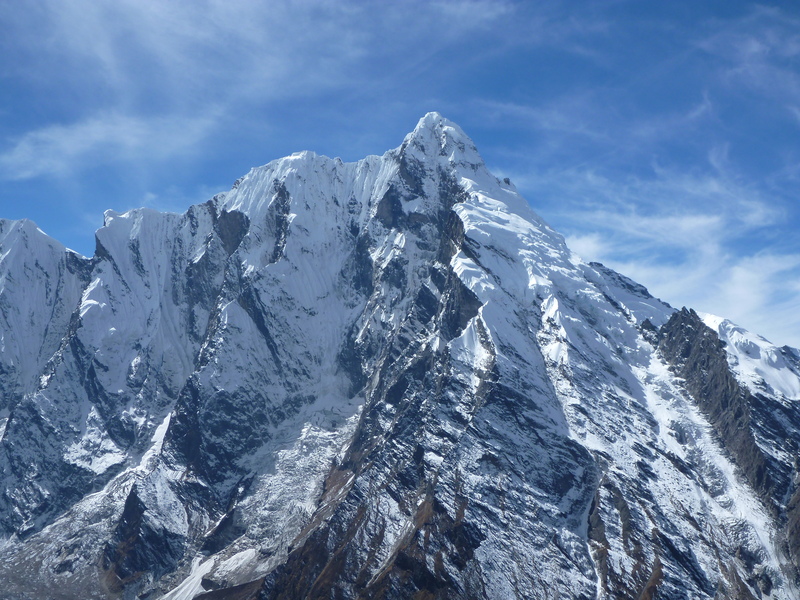 There is something unpleasant to me about this ‘naming ceremony’: perhaps, because climbers refer to mountains in the feminine, or, perhaps, because I simply cannot see what they can. I am, after all, short-sighted and cannot help but examine things more slowly and meticulously than those, whose sight is sharp. After breakfast we begin to consider more realistic route possibilities than the ‘Colorado Direct’. 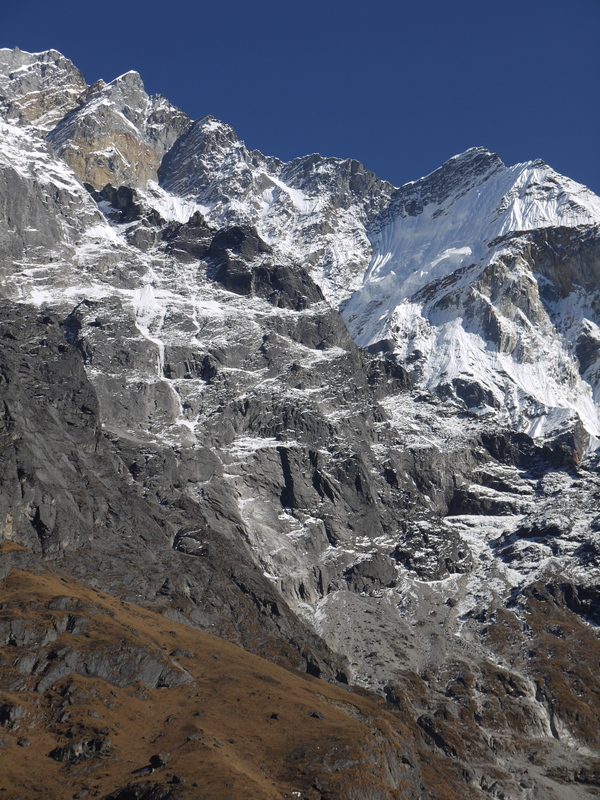 Our main objective is to get onto and establish Camp I on the glacier above 5000 meters – safely. We pick a line for Phil and the Sherpas to explore, which, according to the images from Google Earth, looks like it could take us there. 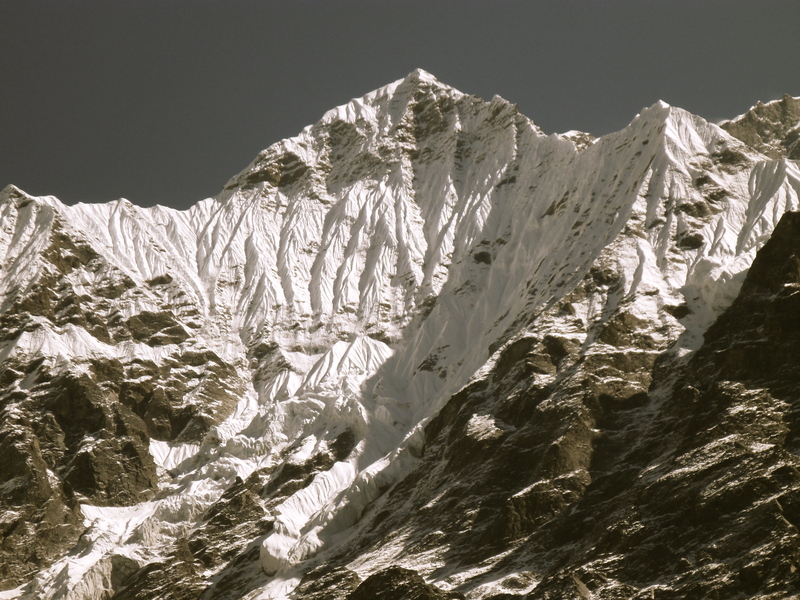 Having spent a couple of days acclimatizing at base camp, the expedition leader and the Sherpa team venture onto the slopes of Ganesh to find and establish the route to Camp I. We watch their upward progress through our base camp telescope and binoculars, and listen to Phil and the Sherpas on the radio. 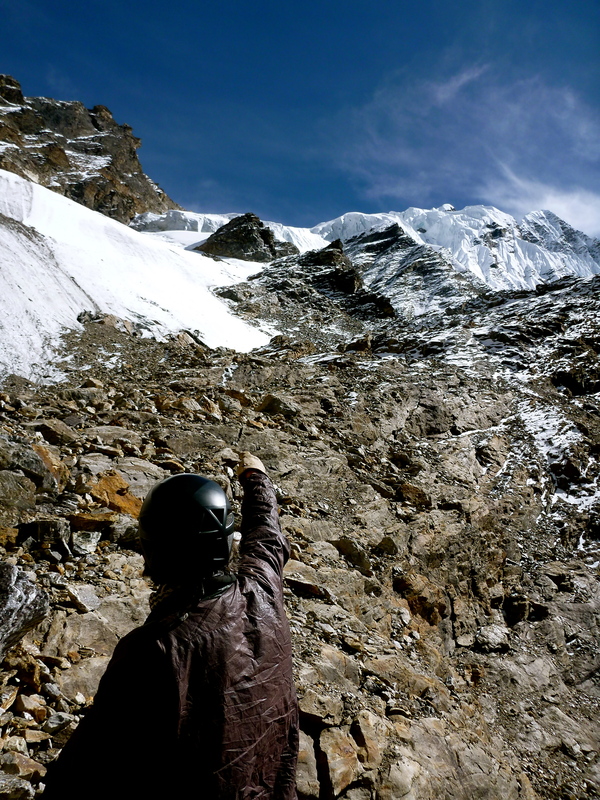 The climbing, apparently, is steep and sketchy, and it is no easy task to find the way to the glacier. However, the very strong climbing team eventually overcome the obstacles before them and arrive at the foot of the glacier, where they find a safe location for Camp I; it’s just after noon. We – the spectators at base camp – are overjoyed, and can’t wait for our climbers to get down to congratulate them on their quick success. 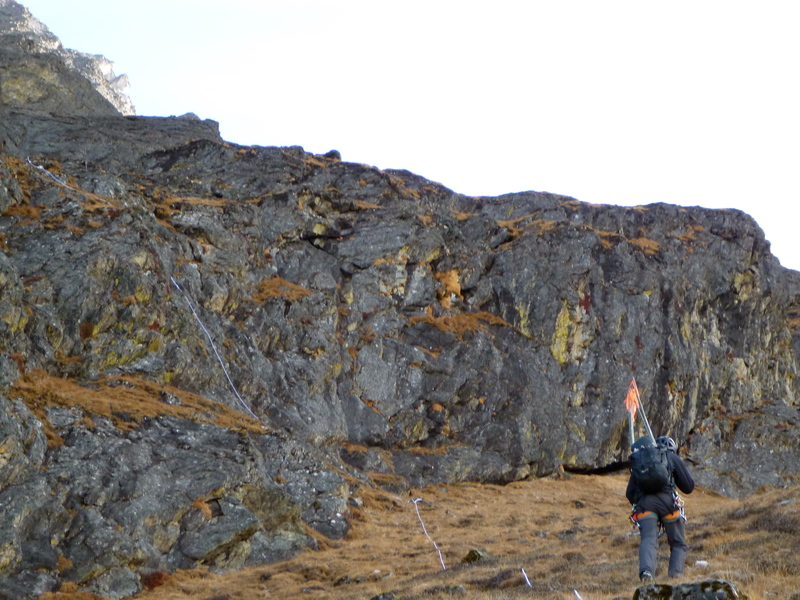 On descent they fix rope to some of the steeper sections on the route, and mark the way with bamboo sticks and cairns. I am excited to see them return, exhausted but happy, to our little tent village; I am also impatient to go climbing on the route they have made and take a look at the glacier above Camp I. So excited and impatient I am, in fact, that I forget I am sick. My Everest bronchitis has returned, brought back to life by the cold and dusty air of the Tsum Valley trails. The cough fits are annoying and depressing, and my chest hurts every time I begin to breathe though my mouth – something I can’t avoid while trekking or climbing at a reasonable pace at altitude. It is only when Phil tells us that we’re going climbing next morning, doing a carry to Camp I, that I realize that gaining about 1000 meters in elevation in several hours will be harder work than usual for my lungs. I know that it would be better for me to get healthy before venturing higher, but I am too curious to stay behind. I stuff my backpack with things to leave at Camp I for future acclimatization rotations and the summit push, and leave for Camp I with the rest of the climbers. I knew it would hurt and it does. As we make our way up the first part of the route, gaining over 300 meters on a steep slope, covered with dry grass, something in my chest wheezes and gurgles at the cold air I breathe in. I have a bit of a fever and my legs are limp, lazy and slow. I try to follow Phil but find it beyond my strength to keep up with him. Luckily, we soon reach the end of the slope, and traverse to the left and into a narrow gully. The way out of it is a climb up near-vertical rock, on fixed rope. I clip into the safety line and attach my jumar to it but only use it as a safety backup. For once, instead of the bulky 8000-meter boots and mitts, I am wearing the right boots and gloves for the job, and it makes all the difference: I can feel the rock and truly enjoy the climbing. Now that the going has gotten steeper and more interesting, my chest has warmed up, and I can breathe, coughing a lot less. This encourages and speeds me up, and I catch up to Phil. We negotiate several more steep sections, which lead us eventually into a couloir, filled with loose rocks. Every step up the couloir triggers rockfall. Long enough for the rocks to gain considerable speed, this section is very dangerous and we must climb it one by one, as cautiously as we can: even the smallest of rocks, having gained enough momentum, can cause a serious injury, and the rocks we tread on here are easily big enough to fracture a limb or worse… It is my turn to go once Phil is out of the couloir, and I hate every step I take on these wobbly rocks, which slide from under my feet no matter how careful I am. Then, there’s a couple more steep rocky sections to climb and a traverse along a ‘minefield’ of loose rocks and unstable boulders to negotiate. 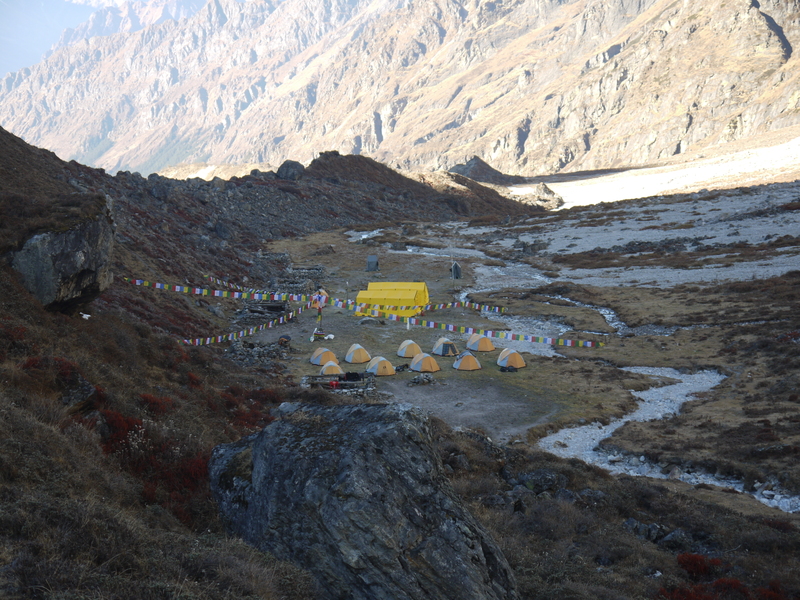 Having gotten past these obstacles, I find myself at Camp I at 11 am, waving at base camp far below. Above me the glacier looks vast and, following the ridge along which we plan to climb to the summit, I let my gaze rest at the objective of our expedition. My daydreaming is frequently interrupted by rockfall coming from all around. The location of Camp I itself is safe from it, but we have a long way yet to go past Camp I. ‘Rockfall, seracs, very likely – many crevasses on the glacier… This will not be a piece of cake,’ I think, hoping at the same time that the going will be straightforward and safe once we reach the ridge. After all our other climbers have arrived, dropped off their gear and rested, we begin the descent from Camp I. I am more tired on the way down that I thought I was, and descending safely, especially, though the rockfall couloir, takes some doing. I rappel wherever possible to save energy, and stop frequently to cough. On the grassy slope, which was such a torture to climb in the morning, one of our kitchen assistants, Bir, is waiting for us with some milk tea and cookies. We’ve had a long day on the mountain, and the gifts Bir bears are just what we need for the final 20-30- minute walk down to base camp. The evening is a happy one. At dinner everyone sounds hopeful and optimistic, and plans are made for our nearest climbing future: the Sherpas will carry more gear up to Camp I tomorrow, and the day after Phil and Sami, expedition co-leader, accompanied by the Sherpas, will search for the route to Camp II. Much depends on what they find above Camp I, and we can only hope that the news they bring us at the end of the day is good. Another chapter in the journey written beautifully…your skills are very impressive. I bet you can’t get a pizza delivered under 30 minutes up there. Probably not at all. But don’t have to worry about the ice cream melting. Our base camp cook actually makes awesome pizza and chocolate cake. And yes, you better be wearing a down suit to dinner if you don’t want to freeze!